Government subsidies have an unfortunate habit of causing widespread economic damage and often result in huge burdens for taxpayers (though sometimes consumers are the ones getting pillaged). Fannie Mae and Freddie Mac subsidies contributed to a massive housing bubble that destabilized the entire financial system. Means-tested subsidies have undermined progress on poverty by trapping people in long-run government dependency. Direct and indirect healthcare subsidies have created a huge third-party payer problem and led to high costs and inefficiency. Agriculture subsidies impose heavy costs on both consumers and taxpayers to reward large, politically connected agribusinesses. Federal subsidies for higher education have helped colleges fund more bureaucracy and saddled students with higher tuition. Unemployment subsidies increase and extend joblessness by giving people money so long as they don’t obtain a new position. 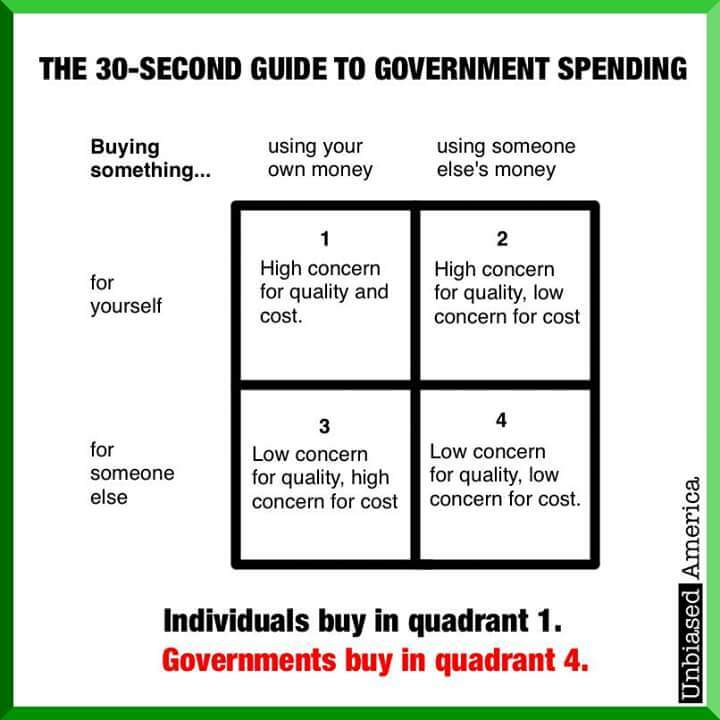 The common thread is that government intervention interferes with the normal operation of the price system and thus leads to distortions since markets are prevented from functioning properly. Let’s add another example, and it’s very timely because of the flooding in Texas. The federal government subsidizes flood insurance. And it does so in a way that is bad for taxpayers and bad for the environment, while also giving a windfall to rich people and putting lives at risk. That’s an impressive list, even by government standards. In a must-read column for USA Today, my old friend Jim Bovard is very critical of the program. Hurricane Harvey…offers the clearest lesson why Congress should not perpetuate the federal National Flood Insurance Program (NFIP)… The ravages in Houston and elsewhere would be far less if the federal government had not offered massively subsidized flood insurance in high risk, environmentally perilous locales. 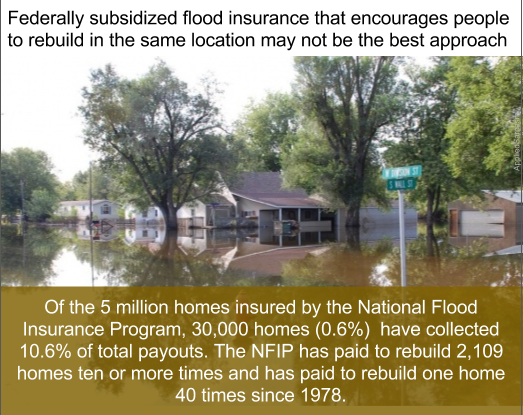 …NFIP embraced a “flood-rebuild-repeat” model that has spawned an almost $25 billion debt. And when Jim says “flood-rebuild-repeat,” he’s not joking. NFIP paid to rebuild one Houston home 16 times in 18 years, spending almost a million dollars to perpetually restore a house worth less than $120,000. Harris County, Texas (which includes Houston), has almost 10,000 properties which have filed repetitive flood insurance damage claims. The Washington Post recently reported that a house “outside Baton Rouge, valued at $55,921, has flooded 40 times over the years, amassing $428,379 in claims. And he points out that the program is reverse class warfare. My colleague Chris Edwards has a comprehensive study of the federal government’s role in disaster relief. Here’s some of what he wrote about the history of subsidized flood insurance. In 1968 the National Flood Insurance Act offered federal insurance to properties at risk for flooding. A key justification by supporters of federal flood insurance was that it would alleviate the need to pass special aid legislation after each flood disaster. As it has turned out, however, taxpayers are now both subsidizing flood insurance and paying for special relief bills passed after floods. …NFIP was supposed to save taxpayers money by alleviating the need for Congress to pass emergency aid packages after floods. Taxpayers were also not supposed to be burdened by the program itself because insurance premiums were to cover the system’s costs. Also, the NFIP included floodplain regulations that are imposed on communities adopting the program. These regulations were supposed to mitigate the harm from floods. None of the promises panned out. …Most importantly, rather than reducing the nation’s flooding problems, the NFIP has likely made flood damage worse by encouraging more development in hazardous areas. Since 1970, the estimated number of Americans living in coastal areas designated as Special Flood Hazard Areas (SFHAs) by FEMA has increased from 10 million to more than 16 million. Subsidized flood insurance has backfired by helping to draw more people and development into flood zones. To add insult to injury, the program is poorly run. The GAO has had the NFIP on its “high-risk” list of troubled programs for years. …In recent years, the program has accumulated more than $24 billion in debt because payouts have far exceeded premiums. Today, the program is in financial crisis and taxpayers will likely bear the burden of its large debt. The NFIP’s financial shortcomings are typical of government-run businesses. Unlike private insurance, the NFIP charges artificially low rates, does not build capital surpluses, and does not purchase reinsurance to cover catastrophic losses. …The GAO says that “by design, NFIP is not an actuarially sound program.” …A 2011 insurance industry study found that overall NFIP premiums are only half the level needed to cover the system’s full costs, and property owners in high-risk areas pay just one-third of full market rates. But the biggest problem is that the program encourages imprudent – and even dangerous – behavior. 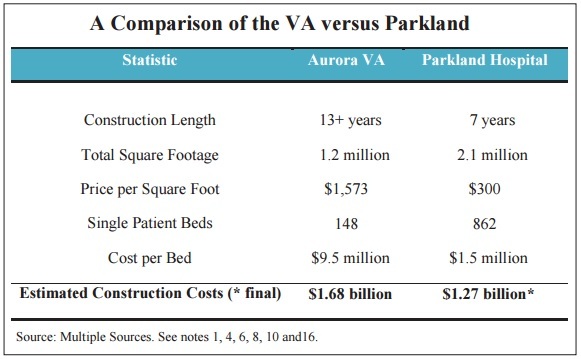 …artificially low rates subsidize people to live in high-risk flood areas. …NFIP is that it has encouraged development in hazardous areas. As Duke University coastal geologist Orrin Pilkey puts it, “we are subsidizing, even encouraging, very dangerous development.” Federal flood insurance has incentivized individuals and developers to build in hazardous areas…more lives and property are put in harm’s way. And the program has plenty of repeat business. …some property owners repeatedly rebuild in hazardous locations knowing that the government will bail them out after each flood. Repetitive loss properties account for only about 1 percent of all policies, but are responsible for about one-third of all NFIP claims. …One Mississippi home valued at $69,900 has flooded 34 times since 1978, and the owner has received $663,000 in NFIP payments over the years. 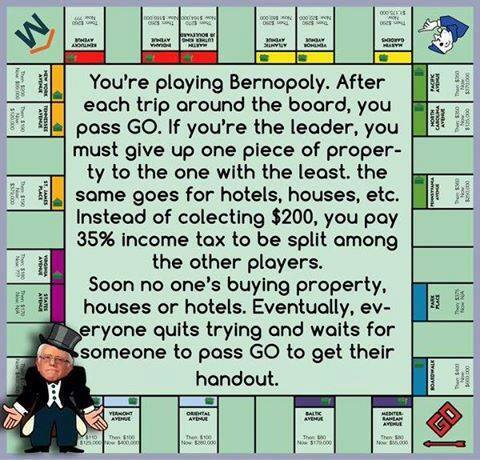 Here’s an image from Reddit’s libertarian page. Very appropriate given today’s topic. An article for The Week looks specifically at how the program lured the people of Houston into taking excessive risk. How do we solve this government-created problem? With the same answer that Chris gave. 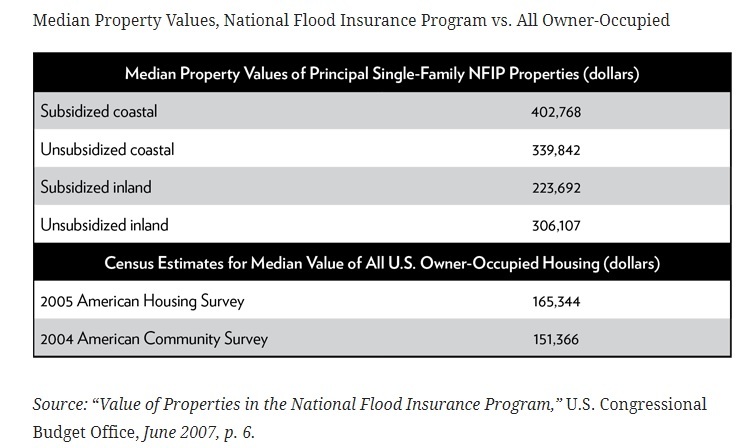 Axing the NFIP and transitioning back to private flood insurance, with its accurate risk signaling, is much overdue. Writing for Reason, Ronald Bailey explains the perverse incentives created by the program. The main lesson that the public and policymakers ought to learn from Harvey is: Don’t build in flood plains, and especially don’t rebuild in flood plains. Unfortunately, the flood insurance program teaches the exact opposite lesson, selling subsidized insurance whose premiums do not come close to covering the risks home and business owners in flood prone areas face. As a result, the NFIP is currently $25 billion in debt. Federally subsidized flood insurance represents a moral hazard, Kevin Starbuck, Assistant City Manager and former Emergency Management Coordinator for the City of Amarillo, argues, because it encourages people to take on more risk because taxpayers bear the cost of those hazards. And, in many cases, bear those costs over and over and over again. Federal Emergency Management Agency data shows that from 1978 through 2015, 3.8 percent of flood insurance policyholders have filed repetitively for losses that account for a disproportionate 35.5 percent of flood loss claims and 30.5 percent of claim payments, Starbuck says. The solution, once again, is obvious. …taxpayers should not be required to subsidize people who choose to build and live on flood plains. When Congress reauthorizes the NFIP, it should initiate a phase-in of charging grandfathered properties premiums commensurate with their risks. This will likely lower the market values of affected homes and businesses and thus send a strong signal to others to avoid building and living in such risky areas. A couple of months ago, before Harvey, the Wall Street Journal presciently opined about the downside of government-provided flood insurance. A classic example of government dysfunction is a federal insurance program that helps pay to drain basements in millions of America’s second homes. …The 1968 program insures more than $1 trillion in property, with about five million policies in 2016 for those who live in areas prone to flooding. The program is more than $24 billion in debt. One reason for the hole is that about 20% of policies are directly subsidized. More than 75% of such policies are in counties in the top 30% for home values, according to a Government Accountability Office analysis, and many dot the affluent coasts of Florida, California and Texas. In other words, this is a wealth transfer from low and middle-income families to the folks who own real estate on Nantucket. …The best reform would be to convert the program into a private operation, though Members of both parties would pile together like sandbags to block it. The editorial noted that Representative Jeb Hensarling, Chairman of the Financial Services Committee, has tried to limit the program. Since he’s a Texan, it will be interesting to see if his pro-market principles remain in the aftermath of Harvey (based on his record, I’m guessing yes). In another Reason column, Katherine Mangu-Ward put together a list of things politicians shouldn’t do once the storm is over. Needless to say, I’m not optimistic that her advice will be heeded. Though you would think some Democrats would be on the correct side, if for no other reason than the program is a big fat subsidy for rich people. 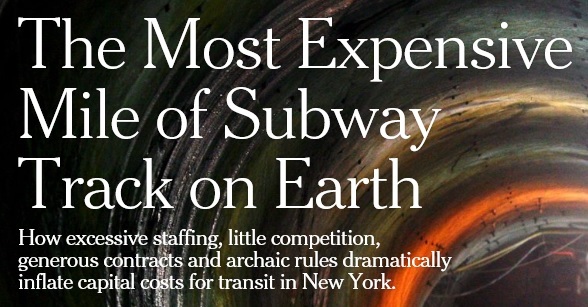 One of those fat cats even confessed that the program is a boondoggle that lines his pockets. Here are some excerpts from a 2004 column by John Stossel. 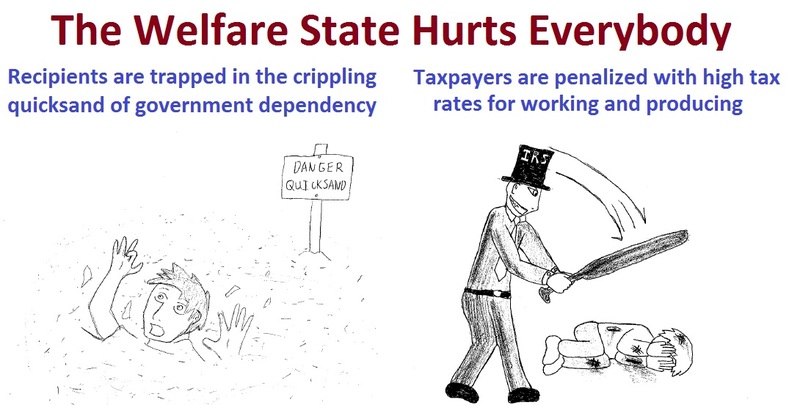 …the biggest welfare queens are the already wealthy. Their lobbyists fawn over politicians, giving them little bits of money — campaign contributions, plane trips, dinners, golf outings — in exchange for huge chunks of taxpayers’ money. John then confesses that he put his snout if the taxpayer trough. I got some of your money too. …In 1980 I built a wonderful beach house. Four bedrooms — every room with a view of the Atlantic Ocean. It was an absurd place to build, right on the edge of the ocean. All that stood between my house and ruin was a hundred feet of sand. My father told me: “Don’t do it; it’s too risky. No one should build so close to an ocean.” But I built anyway. Why? As my eager-for-the-business architect said, “Why not? If the ocean destroys your house, the government will pay for a new one.” What? Why would the government do that? Why would it encourage people to build in such risky places? That would be insane. But the architect was right. If the ocean took my house, Uncle Sam would pay to replace it under the National Flood Insurance Program. Since private insurers weren’t dumb enough to sell cheap insurance to people who built on the edges of oceans or rivers, Congress decided the government should step in and do it. …I did have to pay insurance premiums, but they were dirt cheap — mine never exceeded a few hundred dollars a year. Lots of rich people like this subsidy. The insurance, of course, has encouraged more people to build on the edges of rivers and oceans. …Subsidized insurance goes to movie stars in Malibu, to rich people in Kennebunkport (where the Bush family has its vacation compound), to rich people in Hyannis (where the Kennedy family has its), and to all sorts of people like me who ought to be paying our own way. John was even an example of the “flood-rebuild-repeat” syndrome. …just four years after I built my house, a two-day northeaster swept away my first floor. …After the water receded, the government bought me a new first floor. Federal flood insurance payments are like buying drunken drivers new cars after they wreck theirs. I never invited you taxpayers to my home. You shouldn’t have to pay for my ocean view. On New Year’s Day, 1995, …The ocean had knocked down my government-approved flood-resistant pilings and eaten my house. It was an upsetting loss for me, but financially I made out just fine. You paid for the house — and its contents. Though now another rich person will get the subsidy. I could have rebuilt the beach house and possibly ripped you taxpayers off again, but I’d had enough. I sold the land. Now someone’s built an even bigger house on my old property. Bet we’ll soon have to pay for that one, too. Let’s close with some systematic data on the regressivity of the program. Two of my other colleagues, Ike Brannon and Ari Blask, authored a study on the flood insurance program. 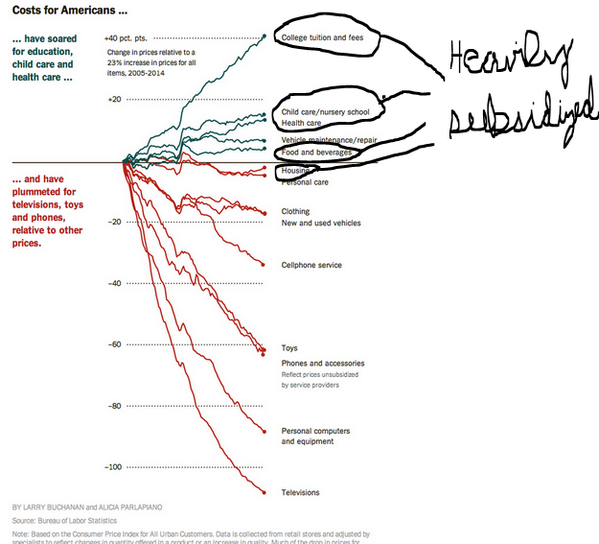 They covered lots of material, but here’s what they wrote about poor-to-rich redistribution. Wealthier households benefit disproportionately from the reduced average cost of flood insurance brought about by government intervention. Of course, not all NFIP-insured properties are high value, but insured homes are on average more valuable than noninsured homes. …In 2007, the Congressional Budget Office (CBO) published a report containing statistics on the average and median values of properties in the NFIP. …The median value of properties in the NFIP exceeded the median value of an American home across all four categories, as shown in Table 1. …40 percent of coastal properties receiving subsidies were worth more than $500,000 and 12 percent were worth more than $1 million. …Comparisons of NFIP premiums with potential private premiums show that NFIP policyholders with the most risk exposure tend to receive the largest subsidy, with 80 percent of explicit subsidy recipients living in counties in the top income quintile. And here’s Table 1 from their study. My guide to having an ethical bleeding heart is very straightforward. If taking money from rich people to give to poor people is wrong, then taking money from poor people to line the pockets of rich people is utterly reprehensible. I’ll write in the near future about why the federal government shouldn’t be involved in disaster relief. But I wanted to specifically highlight the wretched impact of subsidized flood insurance because it is such a perverse example of how government promotes unjust inequality. …attempting to abolish the NEA is a fight worth having, never mind the certain futility of the fight. …Government breeds advocacy groups that lobby it to do what it wants to do anyway — expand what it is doing. The myriad entities with financial interests in preserving the NEA cloyingly call themselves the “arts community,” a clever branding that other grasping factions should emulate… The “arts community” has its pitter-patter down pat. The rhetorical cotton candy — sugary, jargon-clotted arts gush — asserts that the arts nurture “civically valuable dispositions” and a sense of “community and connectedness.” And, of course, “diversity” and “self-esteem.” Americans supposedly suffer from a scarcity of both. …the NEA’s effects are regressive, funding programs that are…“generally enjoyed by people of higher income levels, making them a wealth transfer from poorer to wealthier.” …Americans’ voluntary contributions to arts organizations (“arts/culture/humanities” institutions reaped $17 billion in 2015) dwarf the NEA’s subventions, which would be replaced if those who actually use the organizations — many of them supported by state- and local-government arts councils — are as enthusiastic about them as they claim to be. The idea that the arts will wither away if the NEA goes away is risible. …as Trump prepares to spike the ball and end the game by axing the NEA, there is reason to be optimistic that this decision will be very good for the arts in America. …Arts institutions, which receive the bulwark of NEA funding, are failing badly at reaching new audiences, and losing ground. This is a direct result of the perverse market incentives our nonprofit arts system creates… As the artistic director of an unsubsidized theater company in New York City for more than a decade, I had to compete in a closed marketplace, where wealthy gatekeepers and the government rather than ticket sales pay the bills. …The industry receives more free money than it did a decade ago, and has fewer attendees. That is a broken system by any estimation. …Taking away free government money for the arts won’t make art disappear. After all, art is older than government. It will force artists and arts organizations to finally come to terms with their market realities. Audiences are better than experts at deciding what art is good or important. If a piece of art is so good that nobody to wants to pay for it, maybe it isn’t all that good. …In the American tradition, vaudeville, jazz, standup comedy, and many other art forms were created and grew within the free market, free from government assistance. Under this system there was a tremendous appetite for high art among Americans… President Trump is wise to get the government out of the art game, and all of us will be better off for his decision. For over a decade as a theatre artist, my salary was made possible by taxpayers funding the arts. …In hindsight, and after much reflection and a better understanding of economics, I am truly sorry, and ask the taxpayer to forgive my thievery. However, spilled milk can’t be put back into the bottle. That doesn’t mean that we have to keep spilling the milk, though. It’s way past time to defund and shutter the National Endowment for the Arts. … The NEA and their supporters will trot out research about how many dollars are added to local economies due to things like theatres, symphonies, and museums. Of course, as almost every person with at least half a semester of Economics under their belt is screaming, the NEA’s argument embraces the broken window fallacy. The economic stimulus felt and supposedly generated by the arts community comes at the expense of other markets. …The National Endowment for the Arts model artificially props up mostly unwanted markets by using tax dollars that get funneled through inefficient and wasteful bureaucracies. …What it does to the arts is create a marketplace that supports bad art. …Don’t misunderstand, I love art. Like, a lot. And I’m willing to pay for it, as are many other patrons of the arts. If the National Endowment for the Arts were to be defunded and shuttered, it would help clear the deck of bad art that people aren’t willing to pay the real cost for. …art does enhance life, but having your life enhanced at the expense of others is not a right. People don’t have a right to other people’s money just so they can watch a play or visit a museum. …It’s time for the National Endowment for the Art to be defunded and shuttered.